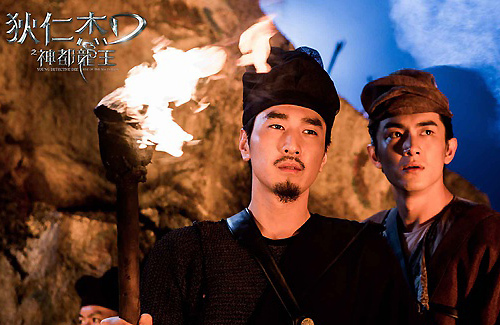 Above: Mark Chao and Lin Gengxin star in “Young Detective Dee: Rise of the Sea Dragon”. After opening to an impressive first-day box office of 64 million RMB, Tsui Hark’s (徐克) period suspense film Young Detective Dee: Rise of the Sea Dragon <狄仁傑之神​​都龍王> has continued its box office dominion during the seven-day national holiday beginning on October 1. Since its premiere on September 28, Young Detective Dee has raked in almost 500 million RMB in total, smashing previous box office records. Although mainland Chinese films have been lackluster this past year, Young Detective Dee seems to be one of the few exceptions. In two days, the film had already reached 94 million RMB, and had broken the 100-million mark by the next day. Industry insiders estimate that at this rate, it may snag a total of 800 million RMB before bowing out of theaters. During the week-long national holiday, Young Detective Dee brought in an estimated 340 million RMB — approximately equal to the total box office for all films during last year’s holiday, which came in at around 370 million RMB. As a result, it set a new record for the highest box office during this calendar period, as well as for being the fastest to attain such a high sum. Young Detective Dee has been praised for presenting viewers with a visual feast, almost as if the movie were transporting them back to the Tang Dynasty. The film’s artistic director, Kenneth Mak (麥國强), shared that Young Detective Dee had a total of 60 to 70 settings – the highest of any Tsui Hark film, according to martial arts choreographer Yuan Bin (元彬). “This film has many stories that wouldn’t appear in other films,” explained Tsui. “Every story about Di Renjie is very big, and many grand settings are required in order to display them.” In order to perfect these settings, the crew began preparations in March 2012 and even hired an artisan to handcraft the floor of the imperial palace. The film’s executive producer, Chen Kuofu (陳國富), and lead actors Mark Chao (趙又廷), William Feng (馮紹峰), and Lin Gengxin (林更新) were all extremely impressed with Tsui’s bold imagination when it came to styling the story’s characters. Feng Shaofeng, who plays a master sleuth working alongside Di Renjie, sports red hair in the film, which he says “gave me an entirely new feeling – it’s something I haven’t tried berfore.” Lin Gengxin also shared that Tsui’s eyes would light up when he saw a certain prop that could be incorporated into the movie. Bingo! That why they needed her for a little diversion from an almost all-male cast. How did you see the movie on YT?! Bluebunny, it’s a Chinese movie, it’s out on the web after the first day! 😛 … I’ll watch it this weekend. I loved Part 1, was cool. I’m just glad that Andy Lau is not in this one. That guy should just retire and give the opportunities to the younger ones. I think he’s still very much a box office draw in HK and China. He’s not stealing jobs from younger actors…producers want him. stupid @iawnaek, hear @nick said “I think he’s still very much a box office draw in HK and China. He’s not stealing jobs from younger actors…producers want him.” SO JUST ENJOY URSELF! Mark surely has been wise in choosing his projects, almost all of his projects have been hits. Watched it ytd, overall so so. The plot has many holes and the case is too easy. Feng Shao Feng lacks the feel of a general while Mark Chao is like small craft than great intelligence. Lin Gengxin is cutie pie and he the best among 3. Kim Bum dun need to act, together with AB they are there to be flower vases. The big monster, actually unnecessary. I dont even have a feel for Chen Kun’s chac, he is unnecessary, too. His chac is special but we dont need him. The best part of the movie is the medicine part :p.
The CGI is good, can say so. Really good. I just watched this one – Angelababy was very pretty and alluring. However, when not done up in her courtesan outfit/makeup, she is also really skinny and almost childlike. I didn’t really watch WATCH the movie though because it was not super interesting – the phantom flame one had a better mystery.